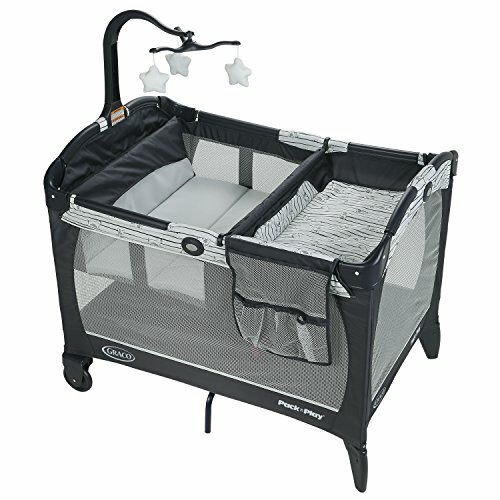 With the Graco Pack 'n Play Playard with Change 'n Carry portable changing pad, keeping your little one fresh just got easier! You can use the convenient pad in the play yard changer or on its own, for diaper changes wherever you are. Then, fold it into a go-anywhere travel pouch and use storage pockets to keep essentials close. Your precious baby will rest easy in the comfy nest bassinet, which later converts to a full-sized playpen to suit your toddler. The toy mobile, wipe-clean changer fabric, simple push-button fold and a convenient carry bag round out this playard' s terrific features.